Here at Magical Vacation Homes, we know that capturing your magical memories is an essential part of your vacation. From Snapchat selfies to professional family portraits, everyone has their own favorite way of documenting their trip. If you’re headed to the Walt Disney World Resort Theme Parks on your Orlando vacation, chances are you will see PhotoPass photographers taking pictures of you with characters or in front of landmarks like Cinderella’s Castle. Keep reading to learn more about Disney Photopass Day 2018 and how to submit your Orlando vacation photos for your chance to win a free 7 night stay in a magical rental home. Disney PhotoPass Day 2018, happening Sunday, August 19th, 2018, is a great way to celebrate this awesome service to have professional photos taken of your family on vacation. If you will be in the theme parks on August 19, 2018, there will be some unique photo opportunities to celebrate! Special photo ops include rare characters, like meeting Pinocchio in Magic Kingdom, or some villains like Cruella de Vil and Jafar at Epcot. There will also be special photo props and “Magic Shots” to enhance your fun family vacation photos. Start your day at Disney’s Animal Kingdom Theme Park for some awesome Pixar photo props from Up and Finding Nemo, then head to Hollywood Studios at night for a special Beauty and the Beast light painting photo opportunity. This special event has photo opportunities starting at park open in the morning at 9 am and lasting until 8 pm, but be sure to check each park’s times guide for special character meeting times. Enter our contest by submitting your photo HERE, or heading over to our Facebook page to enter! Vote for your favorite Orlando area vacation photo once a day until September 30th, 2018. Share with friends and family to get as many votes as possible to win your 7 night stay at The Fun House at Reunion! Here at Magical Vacation Homes, we know what it takes to make your vacation extra magical. If you’re looking at planning your Orlando vacation and are looking for advice on where to stay, contact our Reservations Team either by phone at 1-866-991-3158 or email reservations@magicalvacationhomes.com. Walt Disney World’s highly anticipated Toy Story Land is opening up this summer at Hollywood Studios. Beginning June 30th, 2018, guests are invited to shrink down to toys and play in Andy’s backyard with two new attractions, Slinky Dog Dash and Alien Swirling Saucers, in addition to Woody’s Lunch Box, a delicious new dining location. The Slinky Dog Dash is a family-friendly coaster that will take you up, down and twisting all around the new land. Alien Swirling Saucers promises an out-of-this-world interstellar spin in a toy rocket with the little green aliens. These new attractions join the fan-favorite Midway Mania ride, a 4D “Ride ‘n’ Blast” shootin’ game. After all of these exciting rides, have a bite to eat at Woody’s Lunch Box, a quick-service dining location serving Breakfast, Lunch and Dinner. The menu features classic comfort food with a twist, including S’mores French Toast, “Totchos” (Chili Cheese Tater Tot Nachos), Soda Floats and Lunch Box Tarts for dessert. 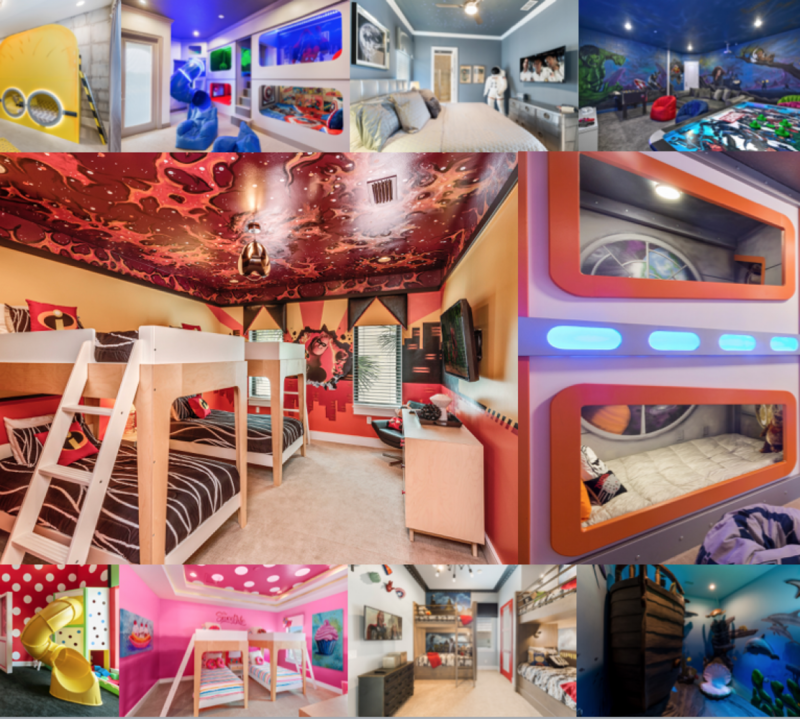 Keep the fun going all vacation by staying in one of our custom built themed rooms, like this one in a beautiful 5 bedroom Windsor Hills Resort home, with a ball pit, slide and TVs in the bunk beds! If you’re thinking of booking your Orlando vacation and have some questions, please contact our team today. We also have our concierge team ready to help with additional assistance.